I was meeting with someone who hated both me and God. I had to meet with her – I knew that – but it took all I had just to show up. I hated the encounters as much as she did. And I was frightened by her. My heart pounded when I saw her; relief flooded me when she left. Relief … and discouragement. Our time together seemed a total waste. I saw nothing to even suggest victory in this spiritual battle for her soul. 2 Corinthians 2:14-15 14But thanks be to God, who always leads us in triumph in Christ, and manifests through us the sweet aroma of the knowledge of him in every place. 15For we are a fragrance of Christ among those who are being saved and among those who are perishing. What bold promises! Always. In every place. Triumph. All this because He is in me and and His presence carries a sweet fragrance. His is an obvious aroma. Really? When I meet with someone, with anyone, can I actually count on God manifesting His fragrance? Yes. I can. Not just sometimes but always. Not just in some places but in every place. Everywhere I go, whomever I’m with, Jesus is present and perceivable. At the least, He makes people aware He is there: they will be as aware of His fragrance as they would be of mine if I’d splashed on excess of perfume. And at the best? At the best, they will be drawn to know Him themselves. His is an obvious aroma. I relaxed. She still hated me, but now I knew, really knew, that our time wasn’t a waste. Nor was it dangerous. I couldn’t see His obvious aroma, but isn’t that what faith is for – making us sure of what we can’t see? Though hidden from my eyes, God’s work was taking place. I rested in that. I counted it as fact. My tension eased. I no longer felt so useless and inept. Our meetings ended – at her option, not mine. I don’t know to this day what impact Christ’s fragrance had on her heart. But I do know that she smelled it; of that I am certain. His is an obvious aroma. Did she continue to recoil from Him and fill her emptiness with Christ-substitutes? Perhaps. Was she drawn towards Him? Maybe. I may never know, but I can pray, and I have. Your Beliefs: Do you believe that Jesus is perceivable through you? If you’ve welcomed Jesus’ presence into your life, you can absolutely count on His fragrance wafting from you. He sends forth from each believer an obvious aroma, the fragrance of knowing Him. It’s a given. Count on it. Do you find yourself trying to “be godly”? Do you wonder if you’re doing it well enough? Your efforts are unnecessary. You don’t have to produce anything. His fragrance is already there. You don’t have to work to create it, and you don’t have to work to get someone else to perceive it. His is an obvious aroma. Their Response: Most of us use another person’s response to us to check if we’re being effective. How about you? Do another person’s responses dictate your behavior? Do others’ actions make God’s promises seem less real? Don’t be misled. God never wastes our interactions but uses each encounter to woo our companion to draw near to Jesus. Now it’s important for us not to be obnoxious, and it’s important to be discerning and kind, but also recognize that someone’s responses may not be to you but to Christ in you. I used to think that kindness was useless – I thought that if I were kind the recipient of my kindness would never understand that I meant what I said. Then I realized the effect kindness has on my heart. Kindness softens me. It makes me receptive. We need to pray that, through our kindness, the Lord will soften the hearts of each person we meet. We also need to be aware that their softening, should it occur, may come years after our kindness takes place. Willingness: Have you ever wanted to avoid meeting with someone? How did you handle it? Think a bit about God’s promise to lead us in triumph. 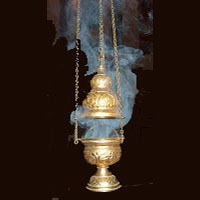 How might faith in the continual presence of His obvious aroma impact your willingness to go into difficult situations? Thank you Lynne, a great reminder when difficult people are brought into my life by the Lord. A reminder that he is sovereign and he has a plan, for them and us. Nancy, you’re welcome.This was one of those difficult experiences that taught me a lot. I’m glad you found it helpful. This is terrific and based on my favorite New Testament passage! Ray Stedman brought these verses home to me back in the ’60s and I have remembered them and applied them ever since. I hope your wise and timely article spreads near and far and is assimilated by many! Lambert, it’s one of my favorite passages too. It sure taught me something I needed to learn! Any help you can personally give to help this post “spread near and far” would be appreciated.